Spans between the second cervical vertebra in the neck and the skull. It lies as a fibrous cord in the triangular interval between the alar ligaments. Tubbs et al investigated the structure and function of the apical ligament in 20 adult cadavers. Anatomically, they found the ligament was absent in 20% of specimens. The ligament was on average 7.5 mm long and 5.1 mm wide. Structurally, the ligament is a small aggregation of elastic fibers surrounding a core of notochordal remnant – essentially it represents a rudimentary nucleus pulposus that is the remnant of notochord seen at other vertebral levels. Arises from the tip of the odontoid process on the Axis (usually from a small coronal groove located there) and inserts into the anterior rim of the foramen magnum at the basion (mid-point). The apical ligament is separated anteriorly from the anterior atlanto-occipital membrane by a thin layer of fat and connective tissue. Posteriorly it is separated from the superior crus of the cruciform ligament by an intervening layer of connective tissue. The tectorial membrane is found further dorsally, posterior to the cruciform ligament. 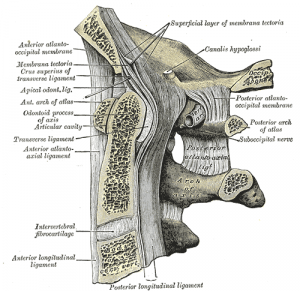 Laterally the alar ligaments extend from the odontoid to the medial aspect of the condyles of the occipital bone. There is no blending or contact between the alar ligament and the apical ligament. Best described as a vestigial structure that offers no significant added stability to the craniocervical junction. ↑ 1.0 1.1 Tubbs RS, Grabb P, Spooner A, Wilson W, Oakes WJ. The apical ligament: anatomy and functional significance. J Neurosurg. 2000 Apr;92(2 Suppl):197-200.